The Tithing Hoax provides you with life-changing answers to your tithe questions. The topics range from pre-law tithing to New Testament giving. The Tithing Hoax gives you the answers to 29 important questions every Christians faces with the modern-day tithe, including: What is the tithe? What did Jesus say about tithing? Does the Bible command Christians to tithe? Has tithing been abolished under the New Covenant? How can the church support itself if church members stop paying tithes? Authors and teachers, R. Renee and Cynthia Harper, walk you through the scriptures and show you what the Bible really says about paying tithes. The Tithing Hoax is 100% backed by scripture. No more paying 10% you can't afford. No more feeling guilt, shame or condemnation because you don't tithe. No more broken "money cometh" promises from Prosperity Gospel preachers. Once you read The Tithing Hoax you may never tithe again! 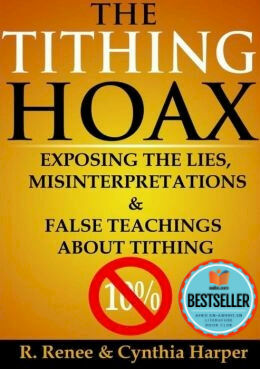 Tell us what do you think about The Tithing Hoax: Exposing The Lies, Misinterpretations & False Teachings About Tithing.